First let’s look at how would you replace a part of a string from the server side. The SQL command simply uses the Replace function in the UPDATE. The above UPDATE command replaces the word ‘constructing’ with ‘making’ in the summary column. In the above example, the column ‘summary’ is a varchar. The Replace wouldn’t work if the column is of data type ‘text’. Argument data type text is invalid for argument 1 of replace function. As you can see from the complaint above, the replace function couldn’t handle the text datatype. The text columns can be handled by using stored procedures (perhaps using updatetext). However, this article looks at doing the replacing from the client side. The advantages of this approach would be that you can use the regular expressions to search and replace in your text. Since it’s on the client side, you can build a gui or perhaps even do additional checks. However, if you have tons of records (thousands or millions of records) that you need to search and replace, the server side would be faster. Most likely you would not do this often – so, replacing from the client side might not be that bad after all. This example has a very simple Forms based UI. Find a piece of string and replace it with something else. The text controls txtFind and txtReplace are used in the code below. This UI can be generalized to include db, table, etc. But to simplify, all that has been placed in the code shown below. The code behind Replace button is shown in Listing 1. // Otherwise, the update below fails. Here ID is the primary key. So, the approach here is to set up a Data Set. You fill this data set by using SQL Data Adapter. In order to get the rows down, you would use a Select Command. At the time of update (the last line of code), the SQL Data Adapter would need to know what update command would it need to use at the time of writing the changes to the database. For this purpose, you will use the SqlCommandBuilder, which will make up the update command (and others) based on the select command you used. For this to work though, the select command must have a primary key or a unique key. 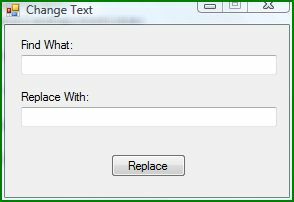 The search/replace is done by using the Regex.Replace. In this case, the find and replace strings are obtained from the text boxes in the UI. Don’t forget to add the following namespaces for the above sql client classes and regular expression classes to work. DOTNET How to match and not match period and other non-alphanumeric characters? The backspace escapes the special characters like period in the regular expressions. This article contains some examples of how to match and not match special characters like period.